Smooth and creamy with a subtle sweetness, Café Crème Cigarillos have been made in the Netherlands since the 1960s. Having sold billions of units worldwide, they are some of the most popular small smokes around. The original Café Crème and Café Crème Arome are made with Indonesian wrappers and fillers from Colombia, the Dominican Republic, and Indonesia, while the Blue variety features an Ecuadorian Connecticut shade wrapper leaf. Whichever flavor you choose, you’re guaranteed a flavorful, smooth, and relaxing smoke that is guaranteed to satisfy when there just isn’t time for a Churchill. Very good small cigars, very enjoyable for a short smoke break when you do not have enough time for a full-size cigar. Very consistent from lot to lot. Excellent aroma and taste. First tried these in Aruba and I loved them. Now that I'm back in the USA I get them from Best Cigar Prices - great prices and fast shipping! Tasted these first in Aruba. Great taste and aroma. Perfect with a beer watching a sunset! Fresh, good tasting, very good draw. 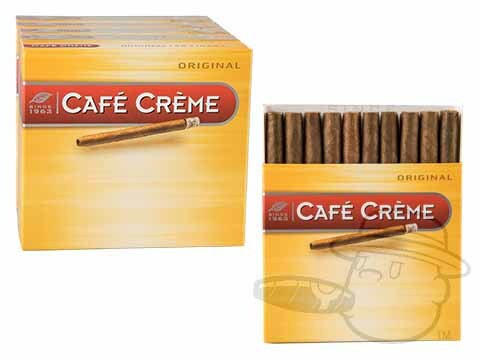 Cafe Creme cigarillos have a great taste and aroma. They burn evenly and are relatively inexpensive at Best Cigar Prices. I first tried them on a visit to Aruba and loved them. If you like small cigars you can't go wrong with the Cafe Creme brand! These are tasty little gems, but the are quite small, so only last a few minutes. Great quick smoke! Cafe Creme Cigarillos is rated 4.4 out of 5 based on 11 customer ratings. No, the Cafe Creme Cigarillos that we carry do not have filters.